Sociology 300 – Matthew G.
Matthew G., known as Nyarlathotep on LittleRubberGuys.com, was willing to be a Sociology 300 participant. 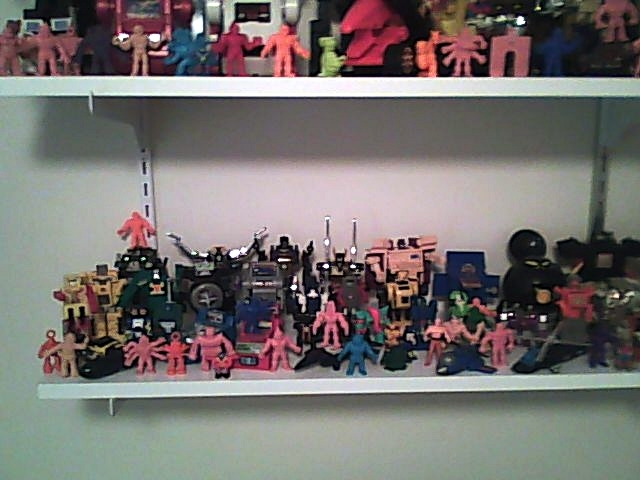 He is an interesting participant because he has only recently started collecting M.U.S.C.L.E. figures. Matthew is able to provide a truly novice perspective on modern M.U.S.C.L.E. collecting. 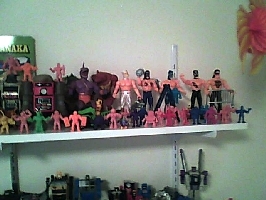 As with many modern collectors Matthew’s connection to M.U.S.C.L.E. is rooted in his past. 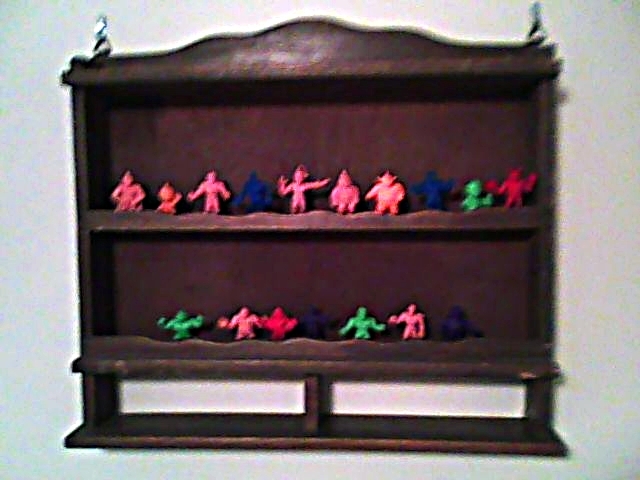 He started collecting M.U.S.C.L.E. figures as a child, at the height of M.U.S.C.L.E. popularity – partially as the result of a friend having the Hard Knockin’ Rockin’ Ring and a few figures. Matthew desperately wanted to play along with his own figures. While Matthew’s friend may have been the original impetus the M.U.S.C.L.E. figures’ small size and seemingly vast array of figure choices fully enthralled him. The inexpensive price point also made the figures easily obtainable, which made them fertile ground for Matthew’s imagination. However, M.U.S.C.L.E. figures did not take center stage in Matthew’s play as a child. The M.U.S.C.L.E. figures were often accomplices or bit players in the adventures of other toys. Matthew held onto his childhood figures and they are the complete extent of his current collection. 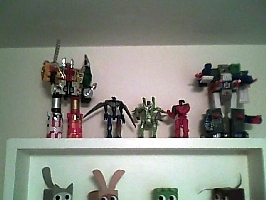 The childhood collection that was built through gifts from his parents and extended family still act as his adulthood collection. The wide variety of figures had interested him as a child and serves as his current main motivator. 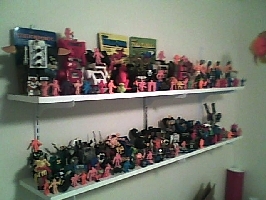 Matthew’s number one priority is to simple collect a set of all 233 poster figures (either Flesh or Color), plus the Hard Knockin’ Ring figures and Satan Cross. Of course, that’s only step one for him. Once he has all of those figures his goal will shift to completing a Flesh set of poster figures. Matthew’s interest in M.U.S.C.L.E. has fueled an interest in the source material for M.U.S.C.L.E – Kinnikuman. He has started reading the manga; peaking an interest in the original Japanese Kinnikuman figures. While Matthew toys with expanding his collection, his favorite piece of his collection is still firmly rooted in his past. Figure #15 was his favorite figure, then named “The Block,” as a child and continues to be his favorite M.U.S.C.L.E. figure. “Farmer Muscleman” (#155), another name given during childhood, is one of the figures Matthew is most excited to own – along with #107, #153, and #195. The four previously mentioned figures should prove very easy for Matthew to locate, however there is one M.U.S.C.L.E. figure that might prove to be incredibly difficult. Matthew would love to own a Drunken Master M.U.S.C.L.E. figure, easily one of the most difficult M.U.S.C.L.E. figures to discover. 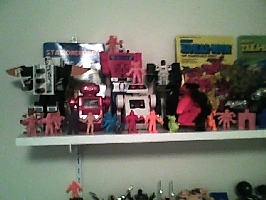 The Kinnikuman Comichara is another item that Matthew would like to add to his collection. While not technically a M.U.S.C.L.E. item he feels that it is the closest thing to a vehicle that was ever produced. 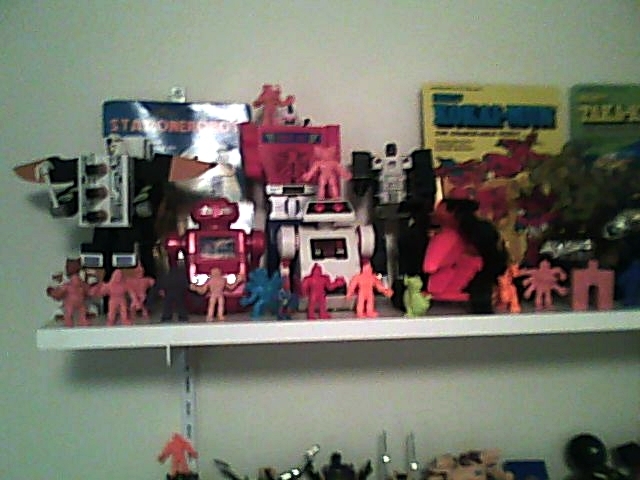 With only his childhood figures currently in his possession Matthew has not developed many of the idiosyncrasies of other M.U.S.C.L.E. collectors. He only recently added his collecting to the MUSCLEDB so that he could track his collection. He isn’t concerned with the condition of the figures, as he assumes it will always be easy to replace it with one in better condition – which is absolutely true for Flesh M.U.S.C.L.E. figures. His only concern with condition is missing pieces, like an arm or foot. 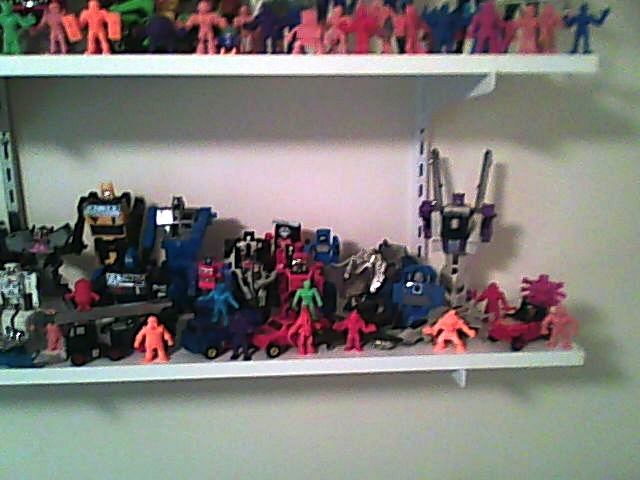 However, he believes that he would still like to display the damaged M.U.S.C.L.E. next to an undamaged figure. If Matthew intends on collecting a set of M.U.S.C.L.E. 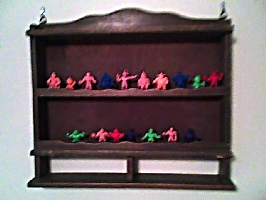 figures, plus displaying any damaged M.U.S.C.L.E. figures he will need much more shelf space because he is a very active collector. 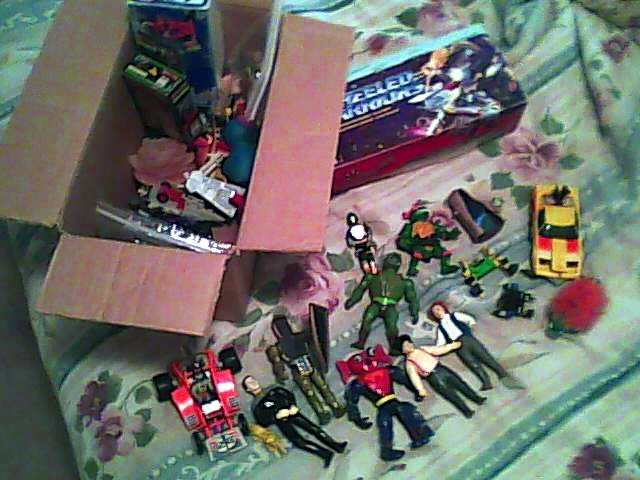 He collects Galaxy Fighters, Robolinks/Blockmen, Thundercats, Starriors, Warrior Beasts, Wheeled Warriors, bootleg figures, and anything odd or unique that appeals to him. His biggest collection is actually robots: Gobots, Machine Robo, Transformers, Zybots, Marchon Mysterians, Robo Force, Convertors, Voltron, and any obscure brands. Collect what you like, and don’t feel bad about it. Ask for advice from more experienced collectors, they are very helpful people. Try to be relaxed and enjoy yourself. Be nice to other collectors/sellers/traders etc. This entry was posted on Sunday, November 8th, 2009 and is filed under Sociology, UofM News. You can follow any responses to this entry through RSS 2.0. You can skip to the end and leave a response. Pinging is currently not allowed. Art 300 Changes « University of M.U.S.C.L.E.